Our company offers you a piece of mind on any service we provide. Call Our Window Cleaners Now! For Solar Panel Cleaning, Call Us! Your windows impact your home a lot: dirty windows means blocking light, and less light in your home makes it feel more cramped. Having your windows cleaned means that your home will feel more spacious and happier. Solar panels are also more efficient if they're being taken care of, and are cleaned regularly. 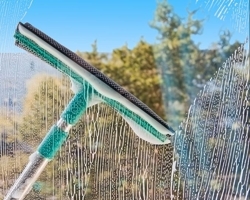 American Pro offers full service window cleaning, including screen repairs, solar panel cleaning, and pressure washing. We've been serving Livermore since 1990 and have worked hard to become the most trusted name in window cleaning. We've grown to know our local territory well, and pride ourselves on offering quick, professional, and thorough service. Give us a call at (510) 402-2219 for complete window washing services. Contact Us for Window Washing! Copyright © 2018 amproclean.org All rights reserved.